Gout is caused by the buildup of uric acid in the bloodstream, and there are certain foods that promote the production of uric acid because they’re high in purine. If you’ve had gout flare ups in the past, it’s likely you’ll have them again, and your food choices are critical for keeping your joints free of pain. Many things can cause a gout flare up including stress and certain medicines. But food is also a known trigger. Being aware of the types of food that can activate gout can help you avoid having a flare up. A diet that includes purine-rich food can raise the uric acid levels in your blood. If you eat one of these types of foods, or many of them at the same time, you may experience a gout flare up. All foods that have protein also have purines. Seafood. It’s all right to eat scallops and salmon occasionally, but it’s best to keep the consumption of seafood to a minimum—and you should cut back on seafood during a flare up. Animal foods are purine-rich, and your body breaks down the purines into uric acid. 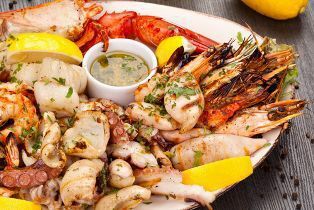 Shrimp, lobster, crab, and eel are fairly safe foods, but stay away from herring, tuna, and anchovies. Beer. If you have gout, there are two disadvantages of drinking beer: it increases the level of your uric acid, and your body has a harder time clearing the acid from your system. Wine provides a better option, but during a flare up, your doctor will likely recommend that you stop drinking alcohol completely. Meat. The purine content in meat differs quite a bit, and white meat is basically better than red—although eating some red meat is okay occasionally. If you suffer from gout, it’s better to indulge in beef or pork rather than lamb or turkey. And it’s best to eat very little wild game. Chicken is a safe choice, but leg meat is better than eating a chicken breast with the skin on. Stay away from liver and organ meats. Sugary drinks. The sweeteners in beverages made with high fructose corn syrup will stimulate the body to produce uric acid. Asparagus. There are certain vegetables that are higher in purines than others—asparagus, cauliflower, spinach, and mushrooms. But it’s not necessary to avoid these vegetables completely, as they don’t present as big of an issue as meat. And a diet rich in vegetables will actually help clear purines from your system. If you’re looking for good food choices that may actually help protect you from gout, pick fruits—especially citrus fruits—coffee, dairy foods that are low in fat, and food with complex carbohydrates. If chronic gout has made it impossible for you to work or perform daily activities, call us at 402-933-5405 to discuss whether you’re eligible for social security benefits. If you found this blog post helpful, share it with your friends and family on Facebook and Twitter. Can I Get Social Security Disability If My Impairments Prevent Me From Working? What Are Common Mistakes People Make When Applying for Social Security Disability? What Factors Are Considered When Social Security Makes a Determination About My Credibility?